In the latest move by the African Union to mediate an end to the Libyan crisis, Guinea’s President Alpha Condé has had talks with Prince Idris Abdullah Abed Al-Senussi. Condé is current president of the AU and is leading the organisation’s efforts to find a solution to the Libya problem. In the talks, Senussi told Condé that Libyans themselves want to have constitution they could all agree on. They had to sit down together and find a way out of the current crisis. That, moreover, had to involve all Libyans, without exception, he said, adding there could be no return to the monarchy for now and no military solutions. As to the Skhirat agreement, it had proved to be a cause for disagreement not progress, he believed. He stressed the need for African Union help in solving the Libya problem. Yesterday’s talks in the Guinea capital Conakry follow a visit there last week by former GNC president Nuri Abu Sahmain accompanied by his deputy Awad Abdul Saddeq and self-declared “prime minister” Khalifa Ghwell. 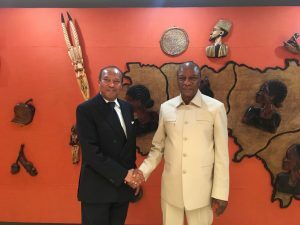 Last month, it was House of Representatives president Ageela Saleh and Beida government foreign minister Mohamed Dayri who were invited to Conakry for discusions. Presidency Council head Faiez Serraj has not been to the Guinea capital for separate talks so far but did meet with Condé at the AU’s mini summit on Libya in Brazzaville, Congo, on 28 January. Al-Senussi also had talks yesterday with Mustafa Sano, the AU’s special adviser on Arab affairs.